YouTube creators Shay Carl, Charles Trippy, Mikey Murphy, among others join director Morgan Spurlock on stage at Toronto’s Buffer Festival to discuss the new ‘Vlogumentary’ doc, a unique look at the phenomenon of video blogging as a passion, industry, and business. Who could forget when Andi walked out on Juan Pablo in the most dramatic pre-rose ceremony ever! “It’s OK” now because she’s starting her journey as The Bachelorette on May 19 on City. What does it take to host the perfect The Bachelorette TV night? We asked Cityline host Tracy Moore, City digital media correspondent Winston Sih and Chatelaine food director Claire Tansey for their hosting tips, including the best ways to use your NextBox PVR to create the ultimate premiere watching party! How would you incorporate the rose into your night? TM: Receiving a rose is the ultimate goal for each contestant as they battle it out for Andi’s heart. So, it should definitely be the focal point of the evening. Channel Chris Harrison by greeting each guest with a red rose, or fill your home with rose-scented potpourri to set the romantic mood. Fresh flowers can be expensive, so seek out fake roses from your local craft store – this way your guests can leave with wilt-free keepsakes. CT: Offer rosé wine or fill a beautiful pitcher with Rosé Sangria. For even more sweetness, bake and decorate rose themed cupcakes – you can learn how to pipe rosettes from Chatelaine. WS: Incorporate the rose into your e-vite. Just as Andi will offer the rose to her men of choice, you too will offer it to your preferred premiere viewing attendees! There are many free online programs that let you create your own personalized rose e-vites, and Some Ecards already has pretty hilarious options too. How do you use your tablet or TV to prepare for, and enjoy, the main event? TM: Set a romantic, cheesy mood by recording romantic movies using your NextBox or search the classics On Demand (Ch. 100). Play a film in the background while everyone’s getting settled or play a music channel for ambiance. CT: As a foodie, I’m always seeking out the latest recipe inspiration. You can use the search tool on your TV or tablet and enter keywords such as “cooking” and “baking” for shows that may appeal. I set a bunch of my recordings this way so I’ll have a personal library of shows to check out when I have the time. WS: Use your tablet to follow fellow fans’ reactions as each contestant is revealed. Seek out Bachelor/ette alumni on Twitter like @AliFedotowsky, @EmilyMaynard or even @JuanPaGalavis! Make sure you’re following the popular hashtags and share hilarious updates and trends with your guests … during the commercials of course! How do you create your dream guest list? Who would you invite and why? TM: First and foremost, determine which friends are The Bachelorette lovers – no need to have negative guests who may question this “unconventional” way to find love. In a dream world, I would suggest inviting old contestants to provide their thoughts and insights, and of course, Chris Harrison for a personal debrief after the show, and to dish out all the inside scoop! What happens when the cameras aren’t rolling?! CT: I think the guest list is up to each individual host/hostess, but for me I would truly appreciate the attendance of not only my hilarious friends, but also my favourite female wits. I envision Nora Ephron, Tina Fey and Gertrude Stein all sitting on my couch snacking on my spicy Georgia pecans and providing their two cents. WS: I’m with Tracy on this one; I’d love to have past contestants in attendance! What’s your essential viewing party etiquette? TM: Premiere night may get quite loud, with excited squeals, cat calling, laughter and maybe even some booing for the soon-to-be villains, as your guests ‘meet’ The Bachelorette contestants. To ensure nothing is missed, develop a fun set of rules for when your guests can chime in during the show, you can even write them on post-it notes as reminder. CT: The evening is all about being social – so serve your guests appetizers, not dinner, so they can mix and mingle with ease. Why don’t you serve snack food with a southern flare, in honour of Andi’s hometown of Atlanta? Might I suggest spicy Georgia pecans – they’re easy to make, delicious and as a bonus they won’t cause any damage if thrown at your TV screen! WS: As Tracy said, your evening may get rowdy so be sure to ask your guests to keep it down during times of high-stress and drama! However, if this seems like an impossible ask (probably – let’s be honest), this is where Rogers Anyplace TV Home Edition comes in handy. Your friends may think they have control over the remote, but you can pull up your virtual remote on your tablet to pause and rewind the TV without them even noticing. Also, as a host it’s good etiquette to provide your guests with your Wi-Fi password, so they too can follow along on social media. How should the evening end? TM: Once your guests catch their breath after meeting all of the eligible bachelors, invite them to fill out a prediction card. Choose a prize for the person who correctly picks Andi’s future man – a “fantasy date” for two? Or a gift card to the salon to prep hair for a hot date? CT: Just as Andi had to make tough choices during the premiere, you too can replicate the rose ceremony drama at home and trick your guests into thinking that not everyone will receive a rose-frosted cupcake from you before they leave. WS: At the end of the episode, while everyone’s nibbling away at their treats, you may want to replay a certain scene. Without interrupting your TV experience, use your tablet again to navigate back to the must-see moments. Want to share the snark? www.citytv.com/toronto/shows/the-bachelorette will host live chats throughout the season. You can also download the app for online chat and fun facts about the show and the contestants. The Bachelorette with my friends’ running commentary is my weekly TV ritual, one that my friends are invited to take part in each Monday night. Tweet a photo @RogersBuzz sharing your TV ritual using #RTVNight and you’ll be entered for a chance to win a NextBox set-up and Samsung tablet. 2. Have your tools on-hand. 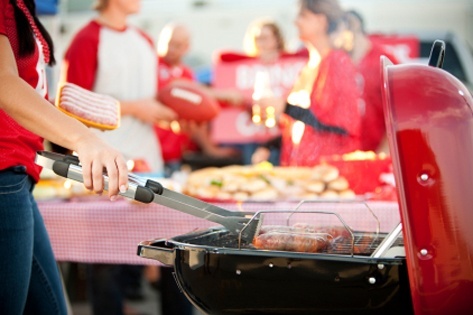 – Make sure you have everything close by before you start grilling. You don’t want to be running back to the kitchen to get a pair of tongs while your steaks are burning. 4. Maintain, maintain, maintain! – Cleaning your barbeque is key. It’s important to take care of the grilling surface by scrubbing the grates at least once per barbeque season. It takes off burnt soot, and allows you to re-grease your grates for optimal use. 5. Grease it up! – By oiling your grates, you prevent food from sticking to the grill – especially fish – and it helps with post-cleanup, too! 6. Grill now, sauce later. – If you brush your sauces on during the cooking process, the sugars will burn up by the time the food is ready to be removed from the grill. As a rule of thumb, wait until your food is almost finished cooking before glazing them. 7. Lid up on the veggies. – The lid on the barbeque traps moisture and smoke which can negatively impact the vegetables’ crunch and flavour. If you’re grilling vegetables, keep the lid up to prevent a rubbery texture. The lid should only be kept down for large winter squashes and potatoes. 8. Timing. – When it comes to meat, tender cuts should be cooked for a short amount of time at a high temperature. Tougher cuts will take more time and should be cooked over lower heat. 9. Let cooked meat rest. – This allows the meat to redistribute all the juices (flavour) back to its connective tissues. The end result: a juicier, more tender piece of meat. 10. Don’t feel intimidated! – There’s no need to feel intimidated at the grill. First-timers should go for something nice and easy that doesn’t require much finesse – whether that’s burgers, a simple striploin steak, or some grilled vegetables. Then you can venture into various cuts of meat that require longer cooking time and more monitoring throughout.